Our donations policy is flexible, allowing people to add items to our archive in ways that suit us both. Read our real-life case studies in the Policy above to see if they fit you. It is being rebuilt using a combination of research, collecting items and Oral History, that means hearing people’s stories told in their own words. To date over 60 hours of interviews have been collected from many different people who have stories to tell. The historic archive is growing too. Photographs, clippings, fashion show programmes, letters and invitations are being added to the physical and virtual archive. A collection of clothing is increasing telling its story through fashions bought in the store. We’re always interested to hear about new items or Mirelle clothing you own. Want to donate but don’t have anything to give? 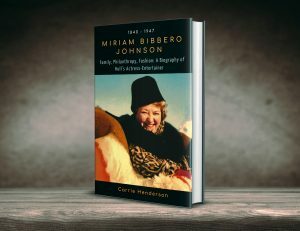 Miriam Bibbero Johnson’s Biography, the owner of the House of Mirelle. All profits from HouseofMirelle.uk’s book about owner Miriam Bibbero Johnson go towards the project. You’ll learn more about her story, have a book forever and also give to the House of Mirelle – win-win! It’s available on Amazon via the link above. Rebuilding Mirelle is creating a permanent legacy from a fascinating and important part of Hull’s history. With it the Mirelle community is filled with colleagues, customers, family members and friends who have reconnected through this research. We ask people interested in donating to contact us via email. We’ll get back in touch. Thank you for your interest in supporting the work of HouseofMirelle.uk. Your contribution is a vital part of telling its story and keeping its history alive.